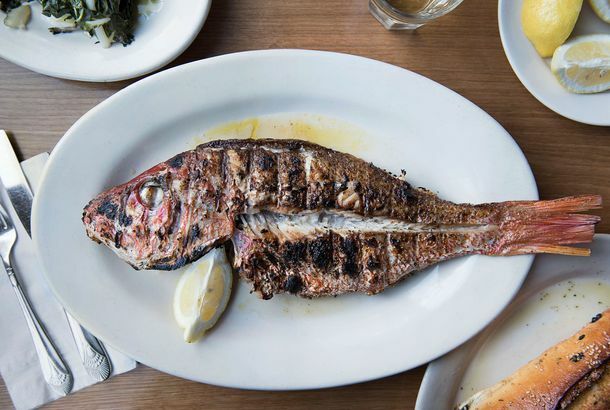 The Absolute Best Greek Restaurants in AstoriaIt’s only a matter of time before the entire globe goes Greek. What to Eat at GRK, Bringing ‘Yeeros’ and Yogurt to the FiDi TodayTerrible name, healthy lunches. Greek Restaurant Will Replace Joe’s SuperetteNo more prosciutto balls, probably, but maybe some dope dolma? What to Eat at Boukiés, Bringing Greek Small Plates and Taverna Fare to theThe restaurant opens today. Michael Psilakis Will Bring His Well-Liked MP Taverna to AstoriaThe first branch of the Greek gastropub, in Roslyn, got a few raves. Opa Introduces Happy HoursThe stylish Midtown Village Greek joint begins offering weeknight food and drink specials. Daphne’s Greek Relaunches, Now With More Kelly SlaterThe chain is rapidly converting into Daphne’s California Greek. The Martha Stewart of Greece Has Opened Her Oregano-and-Lemon DoorsThe Upper West Side is drunk on ouzo. Opa Gets a Hand From Garces’ DesignerThe designer for Garces’ restaurants is developing the look and feel of the forthcoming modern greek restaurant. Xandros Evicted on LaCienegaOwner Adam Kariotoglou attracts police attention after smashing more than just the dinner plates. Gaby’s Expanding in Culver City at Former CamposThe quick-fix Greek and Mediterranean has a fifth store in the works. Xandros Brings Refined Greek To LaCienega, Open Today in 90210Adam Kariotoglou’s restaurant appears more indulgent and authentic than Manhattan Beach’s Petros, which will soon be in direct competition with Xandros. Chef Josh Smith Landing in Las VegasThe chef, who recently left Church & State, will cook at Estiatorio Milos, in the new Cosmopolitan Hotel. New Tastes Hit The 2010 Greek Fest TonightTom Hanks will be there along with new additions from Taverna, TUNICS, and Gyro Burger. Big Fat Pita Landing In Westfield Century City This FallThe eatery claims to have had “proper” education from two New Yorkers. Mykonos Greek Grill Replacing Ble D’Or in Culver CityJoxer Daly’s will soon have a new neighbor. First Look at Beba, Soho’s Mediterranean NewcomerThe menu, the space, and the dishes. Daphne’s Plans to Survive Despite BankruptcyA Greek chain struggles in its native Southern California. Ludo Going Greek at Golden Globes’ Hollywood Helping HaitiOne of L.A.’s hottest chefs will man the Athenos booth. New Food Trucks Arrive From Every DirectionThe food truck trend rolls on and on and on. Gaby’s Mediterranean Expanding EastGaby’s Mediterranean adds a fourth store. What to Eat at Melanthios Greek Char House, Opening TodayA new Greek restaurant in Lakeview puts an authentic spin on the Greektown classics. Rush Street Gets Fraternity Friendly This WeekendRush Street throws a toga party. A First Look at Aqualis and Its ‘Straightforward, Eclectic,Plus, the latest on Michael Psilakis’s Gus and Gabriel. Roving Chef: Michael Psilakis Buys Greek in AstoriaWhere to get the best feta in town. Michael Psilakis and His Octopus Make Their ‘Nightline’ DebutMichael Psilakis follows in the footsteps of Ayatollah Hadavi, Martha Stewart, and other ‘Nightline’ subjects. Memo to World: Michael Symon and Michael Psilakis Are Not the Same Person We ran into Michael Symon last week, a.k.a. the Next Iron Chef; as food celebs we meet are wont to do, he said that he hoped what he told us wouldn’t end up on Grub Street the next day. Jokingly, we suggested that we’d just write about how we ran into Anthos chef Michael Psilakis. “That happens to me all the time,” Symon, said, laughing. You can’t blame people for getting confused: Both men are high-profile, thirtysomething Greek (or part-Greek) chefs named Michael who are bald and happened to open up ambitious Greek restaurants at around the same time. There is, however, one clear difference between the two: Psilakis has a chinbeard, and Symon a soul patch. But this seemed cold comfort to Symon last night. Having frequently been accused of being Terrance Brennan’s doppelgänger, we could sympathize. Now if only we could switch bank accounts.